By following this guide, you can estimate the amount of water stored in a dam, and how evaporation and water for livestock, spraying and other uses will affect water reserves. This guide suits dams up to about 10 000 cubic metres. We recommend that dam volumes are estimated at the beginning of summer, to budget water supplies for the critical dry summer and autumn period when evaporation is high, and demand from livestock, irrigation or household use increases. Your dam may not be as deep as you think! After a few storms and flooding, and years of livestock and loose dry pasture, most dams accumulate a lot of silt and organic material in the base. Desilting dams and building silt traps may be a worthwhile investment. With a few tools and some preparation, the method below gives a useful estimate of dam volume. However, it is difficult to measure the dimensions of dams in use (unless empty), and calculated volumes are approximate. For water budgeting, always assume that the usable volume is 10% less than the calculated volume. This consists of a string held taut across the middle of the dam, with a weighted string attached at about the mid-point. 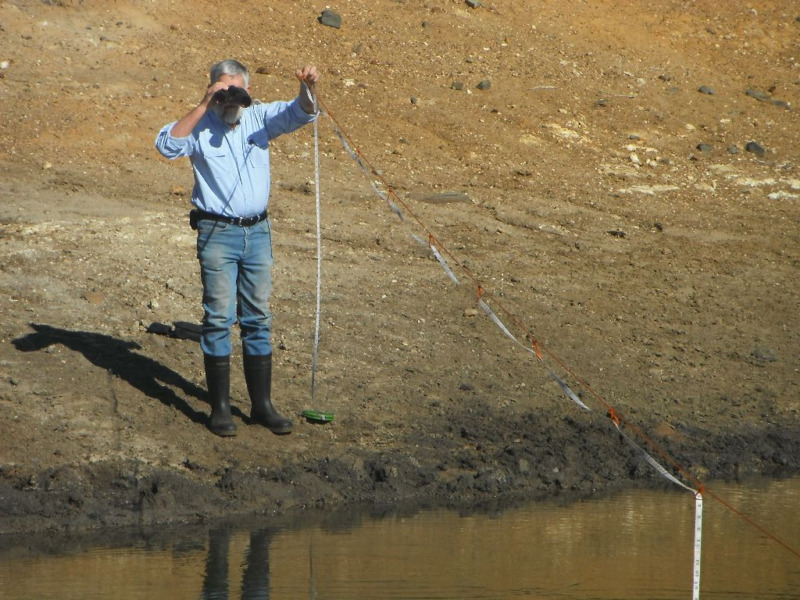 The weighted string should be longer than the full depth of water, and have coloured markers tied to it at set distances so that the depth can be seen from the side of the dam. Allow the weight at the end of the string to rest on the dam floor, and you can see the depth of water from the coloured markers left exposed. On large dams, it may be easier to launch a canoe and measure from the canoe. Make loops in the rope at every metre, enough to get past the middle of the dam. The rope supports the surveyors tape and is a measuring device. The loops should be large enough to easily thread the tape. Thread the tape through the loops, so the rope can support the tape for most of the distance across the longest side of the dam. Be careful to avoid twisting the rope and tape, as twisting will prevent the free movement of the tape through the loops. Tie a weight to the end of the tape to help it sink. Ask your assistant to take one end of the rope and walk to the opposite side of the dam (around the edge is easiest!). Your end will have the loops and the threaded tape. When in position let out the tape until it hits the bottom of the dam. Read the water depth on the tape at the water surface using the binoculars. Move the equipment and measure the depth again until you find the edge of the deepest part of the dam (the edge of the rectangle/square base). Count how many rope loops are suspended over the water. Repeat the procedure across the dam until you find the edge of the base on the other side — closer to your assistant. Again count the number of loops that are suspended over the water. The difference in the number of loops suspended over the water from one side of the base to the other will give you the length of the base of the dam. Record the length and depth of the base. Repeat steps 4–8 at right angles to your first measurement line. You now have measurements for the base of the dam (length and breadth) and the dam depth. Measure the surface dimensions of the water. Pace the length and breadth of the bank at the water surface for rectangular or square dams. Round dams can be measured by pacing the circumference of the bank at water level. Then divide this distance by 3.142 (π) to calculate the diameter. Insert the figures into the following equations to estimate the current water volume. The equations vary according to the type and shape of the dam. Measure or pace the sides or circumference of the dam at the elevation of the spillway discharge. This gives you the top measurements when the dam is full. 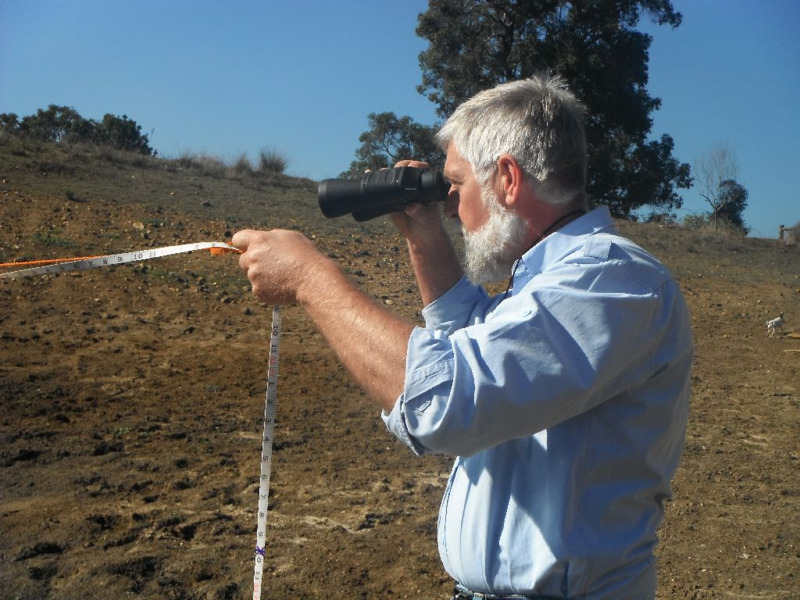 Measure the difference in height between the current water surface and the spillway discharge. Add this measurement to the current depth to calculate the water depth when the dam is full. Insert the new measurements into the appropriate equation below to give you the volume of the dam at full capacity. Measure the depth of water and the length of one side of the water surface. Use these figures in the relevant equation – as in the example below – to estimate the volume of a completed dam. You can also use these figures in the dam volume table to get a rough estimate of volume. Assuming that leakage is minimal, water will be lost from the dam from evaporation and from water extracted for livestock or other uses. to estimate the remaining water in a dam after a given rate of water use. The table refers to conventional excavated dams (earth tanks) of square plan on a level site, and with 3:1 batter slopes. To estimate the volume capacity of a full, square dam, measure its depth (from the bottom of the dam to the overflow level), and the average length of the four top edges of the excavation at overflow level (body of the table). At the measured depth, scan down the column to the nearest top edge dimension. The volume can then be read from the left-hand column of the table. To estimate the volume of water in an existing square dam, measure the depth of water (see the technique above) and the length of one side of the water surface (for a square dam). Use the measured values as in example 1 below. The curves in Figure 4 show how – for a particular dam – the water volume decreases with decreases in water depth. Follow the dam's consumption curve towards the top left hand corner. Use monthly consumption steps equal to evaporation (in metres along the top) and livestock supply (in cubic metres up the side) to move along the curve. By using these steps, you can see when the dam will be empty (assuming there is no inflow). In practice, the last 30cm or so of water in a dam is not usable: direct access by livestock will often lead to animlas being bogged; and mud may clog pumps.